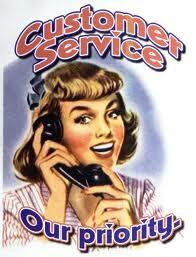 Our businesses depend on great customer service. It seems so obvious stated here, but the concept escapes even some of the most seasoned business leaders. It is as if after the business is up and running that providing great customer service takes a back seat to getting orders filled and out the door. It becomes forgotten and left behind other priorities such as closing the sale, completing the project, and collecting on accounts. All of these processes are important and necessary and in defense of business leaders that tend to lose focus on customer service, employees were hired to fill a role of providing for the customer. Because of this the business leader is usually the last to know that the business is falling short in the customer service department. 1.) Be the customer. This means that you will need to take time to set up some role-playing scenarios to teach your employees how a customer is to be treated. It is not that complicated. Either you or someone you appoint plays the role of a customer. Begin by having the customer be extremely polite and ask general questions. In the next scenario, have the customer be a little bit irate and demanding. Then, gradually, with each scenario, have the customer become downright vulgar. Examine how employees handle the situation and review and critique each exercise. 2.) Ask a customer. Invite a customer that you've met (or even one you haven't) and ask them to sit in on a meeting to discuss how employees could treat him or her better. Make the event worth the customer's time by providing lunch, discounts, etc. Solicit feedback from the customer and have your employees make note of what the customer likes and dislikes. 3.) Love your customer. Pick a day to have a customer appreciation day and invite a few customers to the event. Have your employees plan the event and handle all the arrangements. Put the ball in the employees court and let them love on the customers. This will give your team members an idea of what it means to treat customers well and will also enhance customer loyalty. Before and after the event, talk to your team about the importance of customers and that without them, the company will suffer.